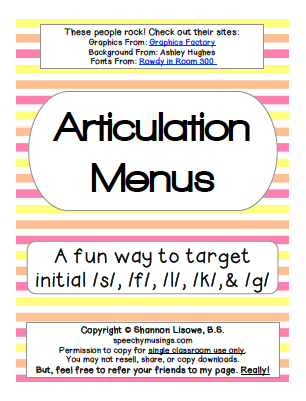 Today I am reviewing a new way to target articulation (and some other skills as well) brought to you by, Shannon of Speechy Musings! Shannon is a first year graduate student! Cannot believe she has time to create such great products while in graduate school. What is it? 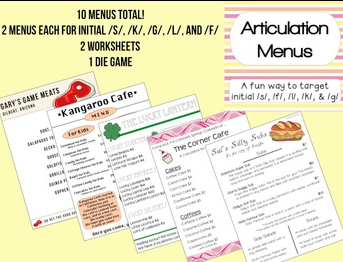 A pack of articulation "menus" for made-up restaurants! Each target a different sound in the initial position! Ideas page that gives all kinds of different ideas for use! Example: Have the students act out a real restaurant. Have one student be the waiter and take orders for all the other students. Then switch so everyone has a turn to be the waiter. 2 menus for each of the following sounds in the initial position: /s/, /f/, /l/, /k/, and /g/. A review worksheet that asks comprehension questions about the menu the student had during the session. A worksheet that includes sequence of ordering (first, next, last) with pictures of the food they ordered. An instruction page for a dice game that asks comprehension questions. Frankly, I am getting so sick and tired of using my SuperDuper articulation cards! I can only look at those pictures so many times. This packet is a fresh new idea to target many different phonemes in one game! Because so many sounds are included differentiation is easy. 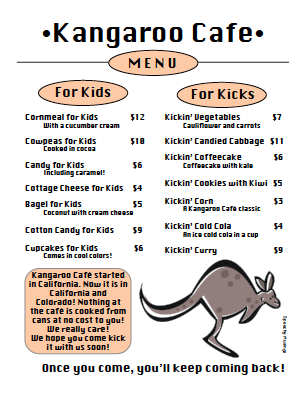 Pass out a menu to each student that has their specific speech sound on it. Pick one student to be the waiter and order away! Shannon also includes worksheets and games to use these menus for other goals. Now we are talking! Targeting articulation and language comprehension in one packet!? Sweet! Also, each menu has a location. Students are later asked where their restaurant was located! 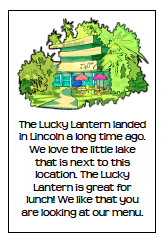 I am Irish, so I am drawn to the "Lucky Lantern." This packet also targets sequencing of First, Next, Last with ordering! So students could pick an appetizer, entree and dessert (or drink). They then get to draw pictures. 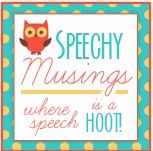 Speechy Musings Facebook, Store and Blog!